It is the season of repeating, renewing and revisiting. The season of the prefix re which means to do again is upon us as we move into the New Year. Around this time last year I wrote down what I wanted to attract for 2013. My discipline in recording it was mostly because I taught a New Year's workshop on the subject of toning your core body and attracting your New Year's wishes called "Fire in the Belly, Igniting Your New Year's Dreams." This year I'm teaching the workshop once again because it worked. I attracted everything I asked for yet it came in differently than expected. Grateful for what showed up, I'm presently making my 2014 New Year's dreams list and most of it surprises me as I write it down because it is bringing clarity to my last year's requests. The picture above are desktop flowers that I will weekly replace to recharge my inner battery as I reread and revamp the pictures for my book "Glamorous Yogini, 7 Seasonal Steps to Heal with Nature, Beauty and Yoga." For quite some time my yoga practice has been focused on preparing for my classes. Meaning I've lost my personal inner investigation of the postures and I haven't been practicing as deeply as I can. This coming year I'm going to re investigate what I can do on the mat. During the past few weeks I've been doing so and already I"m feeling so much lighter. I'm also going to rekindle my belief in knowing what seems to be impossible to achieve at the moment is clearly mine. My feeling is, I keep on seeing it therefore it is coming. Finally my family and I are going to revisit the nature paths we love to walk on together. It is our valuable weekend time where we regroup and refresh ourselves from our everyday routines. You create your life so if it is not working to your liking consider joining me on Saturday January 11th at 3:30 pm and work towards recreating it. This workshop is a slow and strong flow yoga posture practice where we will focus on toning our 3rd chakra, our belly, lower back and side waist body. Our core body is where yogis, shamans and Reiki masters teach our truth and dreams are born. During the class I will thread in dream building wisdom, include private time to write down your New Year's dreams and we will finish our intention building with a meditation in restorative yoga postures. Register for "Fire in the Belly, Ignite Your New Year's Dreams Workshop" at www.bamboomovesyoga.com in Englewood, NJ. As we get ready to take another spin of the wheel and start a New Year I've been noticing that deep back bending has been helping me a great deal in keeping my heart light and open to letting go of what was in 2013, receiving the joy of the holiday season as well as eager to experience the mystery that is on the horizon. Since my personal yoga practice usually shows up in some form in my classes, I've been reminded while teaching deep back bending that having the ability to balance on your hands and feet is key. Mostly because you don't see your arms and feet in most back bends. system. Technically body experts call it your proprioceptive perception that fires in. It is the ability to move and be in space without visual aid. Also when you balance you sit in between movement and stillness making your focus have no choice but to be completely in the present moment thus cultivating a steadier mind. To advance your practice on so many levels and attune to the end of the year's celebrations and transitions I recommend spending a little bit more time in balancing poses. Not only will they assist you to get into big poses like wheel and inversions but they will also help you walk the tight rope with ease into 2014. Bandhas means locks in Sanskrit. According to yoga we have several locks in our body we can contract to not let our energy spill out while we hold a pose and breathe in it. I feel there are three bandhas that are worth understanding and exercising especially if you're beyond your first stages of studying yoga. There is mula bandha the pelvic floor lock, uddiyana bandha the navel lock and jaladhara bandha the neck lock. I've heard from many teachers over the years that to use your root lock is to act like your stopping yourself from peeing. I would say using mula bandha is more subtle than that but feeling like you're stopping yourself from going is a good place to start. Wherever you are right now sit or stand up tall with your chin parallel to the floor and both feet flat on the floor. Gently close your mouth and inhale through your nose. Feel your spine arch a bit as your ribs swell open with air and your chin moves a little bit away from your chest. On your exhale squeeze your inner thighs towards each other, feel your navel draw in and up, filling up your lower back body and let your chin ever so slightly fall towards your upper chest like your tapping a lid closed on yourself. Repeat by inhaling and feel your pelvic body, belly and throat open and when you exhale gently apply your locks. There's no deep squeezing when it comes to using your bandhas that is why yoga calls the bandhas a subtle body teaching. Like the chakras, mudras and chanting, the bandhas are abstract to explain and needs to be practiced and felt rather than over analyzed. The benefit of having a little bandha wisdom is that once you get used to opening and closing them you will be able to hold poses and breathe in them longer, jump to the top of the mat and back with barely a peep as well stand on your hands in downward facing dog and arm balances without having your wrists and hands hurt. The pictures I posted are from my archives and although all postures require bandha work I picked postures that demand strong bandha awareness. I learned about mudras, Sanskrit for hand gestures early on while studying ballet. Although my ballet teacher didn't use the word mudras she often explained that a dancer's hand elongates by reaching far out with all fingers then sealing your energy in by taking the middle finger and thumb to gently touch. Later when I studied a little Indian classical dance I was fascinated with how placing your hands in different intricate positions can convey a sign language message to those that understand mudras. From a yoga perspective mudra making is referred to as a subtle body teaching. Similar to the chakras which means the body's energy centers and the bandhas which means the body's locks. Since mudras have an abstract quality they need to be felt by the practitioner rather than explained in great detail. Therefore in the spirit of keeping my mudra definition simple and easy to digest, yoga's mudras like in dance enable you to appear graceful while your energy is powerfully circulating within and not spilling out as a result of your hand's seal. There are many mudras to choose from that is why I went through my photo archives and posted a few pictures of the most frequently used mudras. Finally a worthwhile mudra fact is that each finger on your hand represents an element in nature. Your thumb represents fire, pointer- air, middle- ether, ring- earth, pinky- water. My suggestion is to be creative the next time you practice yoga and intuitively place different fingers together and feel if it strengthens your stance, lightens your look, contains your energy and connects you to all that surrounds you. As the sun moves through Scorpio and my birthday comes around, I'm feeling grateful and a bit nervous about my next year's journey around the sun. A few choices have presented themselves to me and I need to pick one. Juggling is no longer an option as focus is needed, at least for a season's length period of time. Over the weekend, on Sunday's New Moon and partial solar eclipse I'm calling on the Grecian triple Goddess Hecate. She reigns over the 3 phases of the moon, new, half and full. Besides her moon association her triple Goddess status also refers to the fact that she has the wisdom of the three cycles of a woman's life. Maidenhood, Motherhood and being a Crone. On Sunday I'm planning on meditating deeply as I stand at my crossroads with Hecate's lantern light and receive the boon of where to go. If you're seeking guidance, call on Hecate. 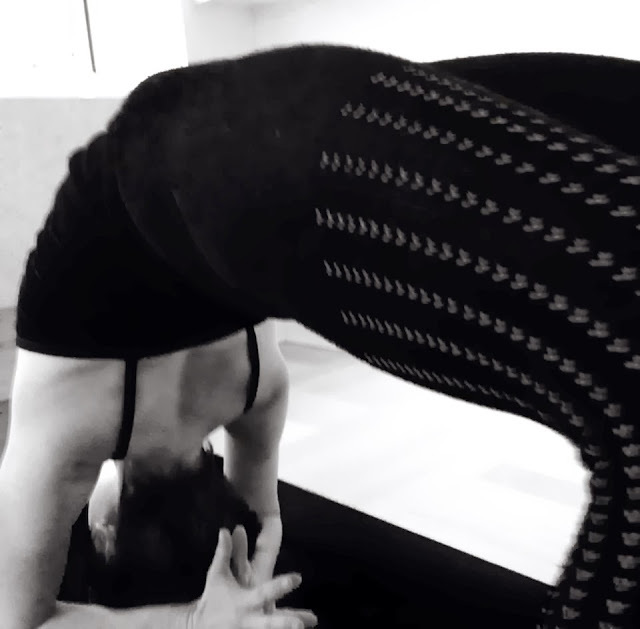 Preparation for urdhva mukha paschimottanasana 1, upward facing forward bend. During fall and winter, the elements air and space reign. Ayurveda, a natural medicinal practice from southern India calls it the Vata season. A time when our schedule overloads, our skin dries out and our appetite craves cozy comfort food while cold dry wind combs the leaves from the trees. As we bring most of our energy inside to welcome the harvest's fruitful dark, the end of the year can offer an anxious frenzy that can lead to a whole host of unbalanced feelings such as stress, anxiety, panic, insomnia, fatigue, depression and constipation (a common cold weather digestive ailment.) What to do? Follow Mother Nature's cue as she moves into a still point and ground like her. Listen to your inner and outer worlds that are yearning for peace and turn towards what wants to be birthed. Strengthen your roots for its arrival by practicing lower body focused Yoga and applying Ayurveda's natural wisdom. In this workshop you will be introduced to Ayurveda then led through a 1 hour and 30 minute yoga practice threaded with Ayurveda's insight. Here you will ground and strengthen your lower body. Release lower back and hip tension. Learn what natural foods to eat to soften your skin, decrease high calorie comfy food cravings and regulate elimination. You will also discover what natural products to use to moisturize your skin and elevate your mood. As well as take a short written test to find out your dosha type. Nearly everyday is a yoga teaching day for me making my personal style accommodate wearing a yoga tank and tights under my clothes. Over the years tunics have proven to be the easiest cover up look however not every tunic works. Some are too boxy, long or short and can feel uncomfortable to wear as an extra layer of warmth when you start and finish class. Gratefully I'm wearing a perfect yoga tunic by CarmenAndersonNY.etsy.com It is a cowl neck tunic top which feels super soft like a second skin. It is perfect to wear all day long as the neck can be rolled down below the shoulders for a more dramatic evening look or pulled over the shoulders for a polished and chic everyday look. Also, I love the way the lines of this tunic flatter your figure without being overly clingy and revealing. Cowl neck tunic top CarmenAndersonNY.etsy.com Carmen Anderson NY is an all year lounge wear line. 9 tops and 4 bottoms. All designed to enhance your beauty. Made with natural knit jersey materials, primarily modal, some rayon and tencel. It is sustainable clothing that is made 100% in NYC. Seated postures are typically practiced towards the end of class. When I'm running out of class time, I may leave them out or quickly teach a simple seated pose before moving into a final relaxation pose. These days as my schedule has me stepping into new territory as the new norm and the wind that combs the leaves from the trees is only getting stronger, I'm finding I need to sit, rest and ground more often during my yoga practice. To satisfy my need to feel grounded, I've been starting my yoga practice and classes on the ground with a gentle version of a very complex seated posture like marichyasana 2 pose which you see in this post. After practicing some light and easy to do seated work, I continue to warm up with Sun Salutations, a standing series and then make it back onto the floor for a deeper expression of the seated pose. After a couple of weeks in a row of practicing different seated postures this way I'm feeling better, balanced and ready for what's ahead as I leave my mat. Another thing I've noticed while practicing more seated postures is I'm getting stronger. Physically these postures elongate the spine, ease stiff knees and ankles, release the hips and groins, giving the body both the strength and flexibility it needs to sit, stand and walk around with ease. On a deeper level, when the body feels good it is easier to quiet the mind, let go and transform like the season. Easy to do variation of marichyasana 2 pose. Start with an open twist. Front hand binds to back wrist. Use a strap if your hands don't meet. Classically marichyasana 2 pose is done with the bottom bent knee in half lotus resting on the bound leg's groin. Realistically few can do this with ease and safety. My suggestion is to try this pose as shown here or note the first picture and the placement of my feet.